IndiaNIC dominates the corporate cricket frontier by registering yet another victory. The eChai Cricket Tournament featured some of the best cricketing arsenals, which were outsmarted by the dominating performance of the IndiaNIC cricket enthusiasts. The tournament featured talents from different corporate brands. There were eight top teams participating in the competition. After thrilling encounters and nail-biting finishes in the league matches, IndiaNIC’s cricket team made its way to the final. In the final, IndiaNIC were against equally strong rival iMOBDEV Technologies. 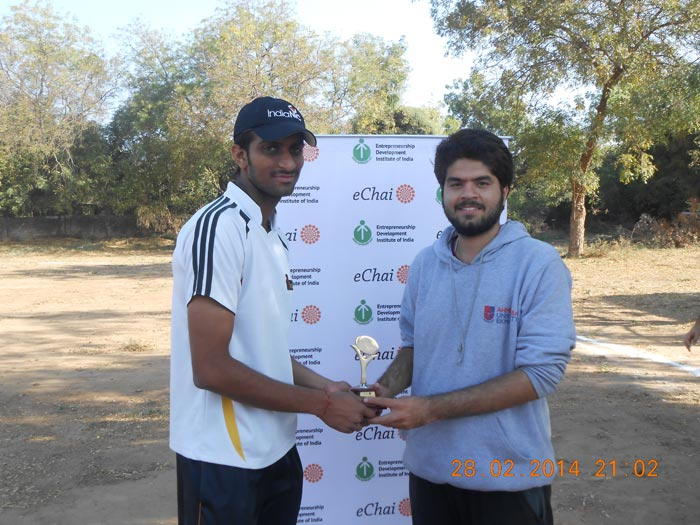 The match was played in the Campus of Entrepreneurship Development Institute of India (EDII). Right from the outset, both teams were keen on getting grip on the match. IndiaNIC won the toss and elected to bat. They imposed a challenging total of 93 runs in 12 overs. This score was very-well defended by consistent bowling and attacking fielding. The opponents were restricted to just 45 runs in 12 overs. Man of the series: Mayur Vaghela. This is not the first time IndiaNIC has lifted the corporate trophy. Along with innovative solutions, the company invests serious interest in the field of sports. The company is keen on nourishing extra-curricular skills of the employee by giving them equal opportunity on and off the working environment. This victory is significant for keeping the work environment motivated. congrats to the whole team! !